View all of our LEED points and their respective certificates. LEED, or Leadership in Energy and Environmental Design, has changed the way we think about how buildings and communities are planned, constructed, maintained and operated. 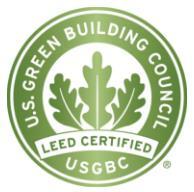 This building certification program is administered by the U.S. Green Building Council. LEED's purpose is to create buildings that are resource efficient, using less energy and water to reduce greenhouse gas emissions. LEED v4 is the newest version of LEED; it is designed to better focus on the materials used in a project, specifically looking at their effects on human health and the environment, as well as their overall performance. This is where Belden fits in. Through several certification processes, Belden's products are being awarded with EPDs, MHAs, and HPDs to help our customers reach their LEED certification goals. Environmental Product Declarations are third-party verified and registered documents that disclose the environmental impact of products during their lifecycle. In order for a product to achieve an EPD, it must first undergo a lifecycle analysis performed using established product category rules. These rules are used as a baseline to analyze the product's environmental impacts, from raw material acquisition to end-of-life disposal. Learn more. Product Lens, a third-party verified transparency document, is only offered through the UL Environment program. Although it's based on the MHA methodology, it gives a much more granular view of each individual potential hazard. Belden's Product Lens reports each chemical (CASN) down to 100 ppm (0.01%) by weight, providing more context than the HPD. Each CASN is color coded depending on the hazard level across the various stages of the product's life. Learn more. The Material Health Assessment is outlined by MBDC's Cradle to Cradle framework. It uses a color coded methodology (green, yellow, red, gray, & black) to assess a product's chemical hazards, each down to 100 ppm (0.01%) by weight. Each chemical (CASN) within a product is profiled for hazards against human health, environmental health, and chemical class endpoint criteria. A single chemical risk assessment is then performed to each potential hazard. An overall material risk assessment is used to assess the group of chemicals, and the most hazardous profiles are highlighted. This certification also enforces a banned chemical list. Health Product Declarations disclose a product's ingredients and corresponding hazards. The HPD lists every chemical used in the product, only identifying the components down to 1,000 ppm (0.1%) by weight with no context given to a product's life cycle. An HPD can be third-party or self-certified. Learn more. 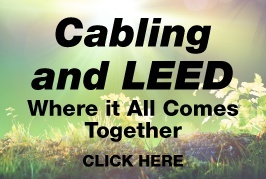 Interested in learning more about LEED? Take our training course to learn more.